Archbishop Alexander (Golitzin) was born in Burbank, CA in 1948 and raised attending Saint Innocent Church, Tarzana, CA. He received a Bachelor of Arts degree in English from the University of California at Berkeley and a Master of Divinity degree from Saint Vladimir’s Seminary. He spent seven years pursuing doctoral studies at Oxford University in England under His Eminence, Metropolitan Kallistos [Ware]. During this time, he also spent two years in Greece, including one year at Simonos Petras Monastery on Mount Athos. In 1989, Archbishop Alexander took a teaching position with the Theology Department at Marquette University in Milwaukee, WI, a position that he left at the end of April 2012. While teaching at Marquette University, he had been attached to Saints Cyril and Methodius Church, Milwaukee, WI. For 22 years, he preached, taught and served at Saints Cyril and Methodius Church, and witnessed to the Gospel and to Orthodox Christian theology at Marquette University. He helped attract a dozen Orthodox Christian students to doctoral work in theology at Marquette. In October 2011, the members of the OCA’s Holy Synod of Bishops elected Archimandrite Alexander Bishop of Toledo and the Bulgarian Diocese. 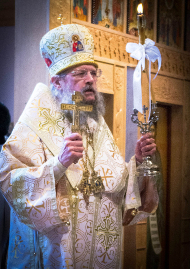 On Saturday, May 5, 2012, he was consecrated Bishop of Toledo and the Bulgarian Diocese during a Hierarchical Divine Liturgy at Saint George Orthodox Cathedral in Rossford, OH. Archbishop Alexander becomes the second Bishop of Toledo and the Bulgarian Diocese. He succeeds His Eminence, the late Archbishop Kirill [Yonchev]. Archbishop Kirill had overseen the diocese from 1964 to 2007; in 1976, Archbishop Kirill had brought the diocese under the omophorion of the Orthodox Church in America. On March 30, 2016, Bishop Alexander was elected Bishop of Dallas, the South and the Bulgarian Diocese. During the 2017 Spring Session of the Holy Synod, he was elevated to the rank of Archbishop.